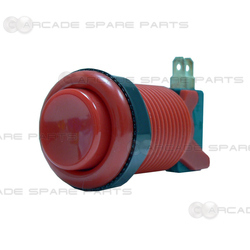 A standard arcade 35mm push button made of durable nylon plastic. The button is a round and concave style push button that works with horizontal mounted micro-switches. It features a long shaft designed for mounting in metal or wooden control panels. The push button can be mounted in material with a thickness of up to 20 mm. Built with quality materials to withstand at least 10,000,000 presses.